Various NPCs and creatures can follow you while you're playing the game and be your ally. These followers can fight by your side; some can also carry your equipment and perform other tasks. Followers can be divided into those who follow you indefinitely (until they die or are dismissed), and those who follow you temporarily (for example, during a quest). Permanent followers usually become available after you complete a quest of some kind. You can also find mercenaries for hire in the cities and recruit certain creatures in the game. You can have at most one permanent NPC follower and one creature follower at any time. Some NPCs follow you temporarily for the duration of a quest. If you avoid completing the quest and go somewhere else, they may follow you around. As many of these NPCs are unkillable, and you can have several followers at the same time, you can use them to fight difficult enemies in a different questline. There is no limit to the number of such temporary followers that you can have at one time. Potential followers will say that you already have a follower and be unable to join you if you are on a quest that gives you a temporary follower. In such cases the quest follower already occupies the follower slot until the quest is completed. For example, in the Proving Honor quest, Farkas will occupy the follower slot even if you have not yet gone to meet him at Dustman's Cairn. The slot can be freed again simply by completing the quest so that your temporary quest follower leaves your service. For followers that are available in the Dragonborn add-on, see this article. You can interact with permanent followers by talking with them (outside of combat). You will then be able to exchange items with them, or give a command, depending on their abilities. You can also start commanding your follower quickly, even from some distance away, by pointing at them and holding the activate/use control. Chop wood/mine ore (only some followers will do this). The benefit of this is that you can avoid the animation and your follower does not get encumbered. Some followers also do not require a pickaxe or a woodcutter's axe to perform either of these. Followers do not need lockpicks to open containers. A follower can pick up a "placed" skill book, which you can then take from their inventory without having to read it first, allowing you to save it for later. Also, followers can use a torch (only one is needed, it will never deplete). Temporary, quest-specific followers usually do not take orders; if they do, they will only take limited orders, like the "wait" command. If your follower is left to wait for a long time, a message will appear that the follower has grown tired of waiting and will start walking to their originating location. You can trade items with some of your followers to equip them with better items or store excess loot. Sometimes, they will refuse to equip the items you give them. Pickpocketing the items you wish them to replace with the improved items can help fix this. It can also allow you to do this with NPCs who will not trade their equipped items with you. However, it requires the Misdirection (for weapons) and Perfect Touch (for armor) perks to achieve this. Giving a non-essential follower any of your custom enchanted weapons or shields, letting them die, and then looting directly from their corpse is the only way to remove those enchantments on the given items. This only works with weapons and shields that you have enchanted yourself- it will not remove the enchantment on artifacts or generic enchanted gear found or bought. 2: Property Crime Only. The only crimes the NPC will commit are property crimes (e.g., theft). 3: No Crime. NPC is not willing to commit any crimes. Followers with this morality will still not report crimes that they witness you committing (with the exception of crimes against them, such as stealing items they own). However, nearly all followers have a morality of either 0 or 3, the only exception being Sven. If you ask a follower with sufficient morality to perform an illegal activity, you may be held responsible for the crime, and your bounty will increase accordingly. This will also occur if they see you committing a crime. [verification needed — Is this true even while they follow you?] If you are hidden, most crimes you command your follower to commit will go unnoticed. A follower levels up according to your level, up to the follower's maximum level (which varies for each). Each follower, except J'zargo, CelannDG, DurakDG, IngjardDG and FreaDB, has a maximum level and a specific set of primary skills, which are dictated by their class. This leveling occurs regardless if they are actively following you. Prior to patch 1.6, a follower's skills, health, and other stats were set when they were first spawned (which is typically when you enter their starting cell, become a Thane, and so on) and would not increase as their level increased. Prior to the fixing of this failure of stats to update with patch 1.6, players could update a non-essential follower's stats so they would increase based on their current level by using the Wabbajack to polymorph them into another creature, after which their stats would update upon recovering their original form. Players of the PC version could also use certain console commands to fix any follower's inability to update their stats with each level the player gains. All permanent followers become protected NPCs while they are actively following you. When your follower would die due to an enemy attack or a trap, they will be incapacitated for some time and begin to recover their health, just like essential NPCs; enemies will stop attacking or targeting them during this time. However, if they lose all their health again during this period, they will die for good. Thus, you should try to move the fight away from them, so that they are not hit by a stray arrow or area-effect spell. They can die from a damage-over-time effect that is stronger than their health recovery; most commonly those are caused by poisons. If you strike your follower dead, on the other hand, there is no recovery. Attack carefully when your follower is low on health. Follower death caused by you, even accidentally, counts as murder on your crimes list. However, it is possible to mitigate damage to your follower with the Companions InsightDB ability if you have read the Black Book The Winds of Change. Many temporary followers are "essential", so they cannot be killed, only incapacitated for a while. Non-essential ones will die immediately when struck down, just as ordinary NPCs. Seven permanent followers are essential as well: Derkeethus (due to a bug), Mjoll, two Dark Brotherhood Initiates, Cicero, SeranaDG and FreaDB are essential. It is also possible to heal damage and quickly return the follower into the fight by having traded to them some standard healing potions (e.g. Potion of Extreme Healing) but not potions you made by alchemy. They will consume the standard potion, heal, and quickly rejoin the battle. Otherwise you may have to wait until all enemies in the area are removed before they recover. You may also use a restoration spell like Healing Hands, Heal Other or Grand Healing on your follower, which is beneficial to you as well since you will gain experience in Restoration. It should be noted, however, that followers will not always drink healing potions if they have any in their inventory, even if they are kneeling and recovering health, so the best bet would be to have Healing Hands ready for use. Followers do not take Water Damage, and cannot drown. However, they do not have infinite breath (with the exception of Derkeethus, the only Argonian follower) unless you give them a waterbreathing enchantment to wear (see Follower Equipment below). If they run out of air, they will abandon their post by your side and swim to the surface. To avoid near death experiences, followers should be traded better armor in the skill type they prefer (either heavy or light armor.) The DamageResist variable can be increased by tempering the armor and shield. In addition, wearing armor pieces or shield awards a hidden 25 bonus points per item. The 125 possible hidden points are not reflected in the DamageResist variable, but are counted in combat. Providing equipment with magic resistance enchantments (ring, necklace, and shield) increases their MagicResist variable. The follower is less likely to be incapacitated if provided all of these enhancements. Should your follower be slain, their body should disappear in about three days. Their coffin with their belongings will most likely be found in the Hall of the Dead in or near their home town. Permanent followers have the ability to trade money and goods. This gives you free access to anything the follower is carrying, with the exception of certain default items that are hidden from you, and allows you to manage the follower's inventory. There is no penalty for taking anything the follower has, including gold, jewels, and enchanted items. In addition to any other equipment they may have, followers will automatically receive a hunting bow and 12 iron arrows when they start following you. These are specially modified variants of the regular ones which do not appear in the follower's inventory. This can cause the bow and arrow usage bugs noted below. The bow and arrows will be removed when the follower leaves your service. Followers will make their own decision however about which equipment they use, given the choices that they have in their inventory. If they have multiple items of the same type (e.g. an Iron Sword and a Steel Sword), they will try to choose the "best" item from their choices (Steel Sword). Sometimes this doesn't work as expected and inferior equipment gets used instead. This normally happens with different grades of the same item that have been improved through Smithing or Enchantment (e.g. a Steel Sword being used instead of a Flawless Steel Sword). You cannot force a follower to use the "right" item other than by removing all the wrong ones that they prefer from their inventory. The item must also be "better" than the default item the follower started with. Giving a follower who started with Steel Armor a set of Banded Iron Armor will have no effect because it isn't as "good" as the Steel. Note: since all the different types of mage robes are classified as clothing with no armor value, giving a mage follower who starts with apprentice robes a new set of master robes has no effect because it's not seen as an improvement on the class of armor (exception: the Archmage's Robes[verification needed — see talk page]). They normally can, however, be given actual armor (such as leather, elven, glass, etc.) with improved enchantments on it, which many will equip due to the higher armor value. The exception is mage followers who begin with hooded robes; if you give them an item which fills the head slot (a hood or a circlet), they will equip it in preference to the hooded robes, which then causes them to have an empty torso slot, and they will equip torso items (like robes) in preference to nothing at all. If you give them (non-armor) torso slot items without giving them a head slot item, they will keep their hooded robes equipped. Normally, you cannot take a follower's default apparel - unless they are killed in battle. Then you can search their body, removing anything they were carrying, including their default items. There is one other exception to this rule: your spouse. After you get married, your follower spouse will open up a general goods store, in which your spouse will sell whatever items are not equipped in addition to what's in your spouse's merchant chest (if you're at home). If you get your spouse to wear something that isn't default apparel (normally you do this by giving your spouse an improved piece of armor) then the default apparel that isn't being worn will become available for sale. You can then purchase it, and then give your spouse anything to wear in that slot and your spouse will wear it while following you. There are two caveats with this approach: one, if you purchase all of your spouse's default apparel, your spouse will respawn new default apparel, so you must leave at least one piece of default apparel in your spouse's inventory, and two, if your spouse is not following you, your spouse will not wear any custom apparel, but will only wear whatever default apparel is left in your spouse's inventory. Because followers choose which items to equip, verify that your follower equips the enchanted item(s). Fortify <Combat Skill> does not increase the amount of damage they do. Fortify <Magic School> does not reduce enchanted weapon usage cost at all, or remove it at values of 100%. There are reports that this effect does work for some followers, but very few. See one of the archived discussion pages for more information. There are reports that damage enchantments on bows do work for followers with the Dawnguard add-on. Some report it only works for them with add-on bows, though others have reported it with vanilla bows as well. The tables below list the permanent followers available in Skyrim. For followers that are available in the Dragonborn add-on, see this article. Once enrolled as a member of the College of Winterhold, your fellow students can join you, but you must first complete their specific quest. Simply talk to them and they’ll tell you what you must do. These followers wear robes as their default apparel, so they will accept any armor given to them; however, they will not equip any other robes, since all robes have an armor rating of "0". They will accept weapons and shields, but they will immediately switch back to dual-wielding spells when an enemy is encountered. Once their Magicka runs out, they will resort to using their bare hands until it recharges. † Version 1.0 of the Unofficial Skyrim Patch caps J'zargo's level at 30. All of these followers can be located at Jorrvaskr, the Companions faction headquarters in Whiterun. You must join the Companions and complete the quest line before they can be recruited as followers. Members of the Circle have a maximum level of 50. Other Companions have maximum levels of 25. All followers from the Companions faction have a Morality value of 3: No Crime. NPC is not willing to commit any crimes. Followers with this morality will still not report crimes that they witness you committing (with the exception of crimes against them, such as stealing items owned by the follower). Complete all the quests for the Dark Brotherhood to allow these followers to join you. These NPCs are added by the Dawnguard add-on. For creature followers added by Dawnguard, see this section. These NPCs are added by Dragonborn. Frea A female Nord warrior from Skaal Village. You will have to complete the quest associated with each follower in order for them to join you. Hirelings are mercenaries; you’ll need to hire them for a set price of 500 gold. They are usually found in taverns. They’ll stick around until they’re dismissed, at which point they'll return to their starting location and you’ll need to pay the fee again to get them back. If they're particularly fond of you or you only dismissed them a short time ago, they may rejoin your service free of charge. The maximum level of all hirelings listed here is 40. All hirelings have a Morality value of 0: Any Crime. NPC is willing to commit any requested crime. Housecarls are bodyguards of noblemen. After completing a quest for the jarl of each major hold, they will proclaim you a thane of their land and give you a personal housecarl. These housecarls won't exist in the game until you become a thane; however if you lose your thane status in their original hold, they will remain and will continue to be available as a follower, and will also continue to address you as thane. Three new housecarls are available after installing the Hearthfire add-on. All player personal housecarls are warriors who specialize in One-handed weapons (except ValdimarHF). Their primary skills are: Heavy Armor, One-handed, Archery, Block (except Valdimar). The maximum level of all housecarls is 50. All housecarls have a Morality value of 0: Any Crime. NPC is willing to commit any requested crime. These orcs are available from their respective strongholds, and each require the relevant quests to be completed in order to be recruited. All Orc stronghold followers have a maximum level of 30. All Orc stronghold followers have a Morality value of 3: No Crime. NPC is not willing to commit any crimes. Followers with this morality will still not report crimes that they witness you committing (with the exception of crimes against them, such as stealing items owned by the follower). To convince these followers to join you, you’ll need to complete their quests. Faendal A male Bosmer Thief found in Riverwood. In addition to NPC followers, certain creatures are also recruitable. You can have at most one permanent NPC follower and one creature follower at any time. If kept as a petHF, they will return to your home when dismissed, and be available whenever you want them. The hitbox of dog followers is larger than the dog as a visual object; thus, if a dog follower is between you and an intended target, you may hit the dog even when it appears to be peripheral to your line of sight. There is a bug that may affect any adopted dog. See the Dog article for details. Some NPCs follow you until a quest is completed or an event occurs. Quest followers will not give you access to their inventory. Generally they are marked as essential so they cannot die and may be useful to have around before finishing their related quest. These followers are only present during certain Dragonborn quests. Followers are not affected by diseases. It can be quite easy to outpace most followers and lose track of them (e.g. light armor wearers with heavy armor followers). Pathfinding can make followers difficult to manage. They cannot jump up or across anything, though they will jump down if there is no other path. If you jump up a small hill, be prepared to see your follower take an extremely long path around. Quite often a follower will get stuck with no path to you. In these circumstances, it appears they are supposed to simply teleport near you, but this can take a very long time to trigger if it triggers at all. The only known guaranteed ways to get them to appear are to fast-travel, change zones (loading screen) or to wait. You can pickpocket your follower's starting items with the Misdirection and Perfect Touch perks if they are not following you, although they may reappear afterwards. Followers can and will attack your horse, summons, thralls and other temporary followers if hit by them enough. This is common when escorting a temporary mage follower, or summoning an Atronach that uses area of effect spells. When damaged badly enough by rockfalls or traps that are triggered by you, a follower may leave your service and attack. This can usually be corrected by yielding at which time the follower can be rehired. It is possible for a follower to enter combat mode when a random brawl is started or when an NPC carries out an act that could be seen as aggressive towards you (as with the Magic Student random encounter). When anticipating a brawl or "initiation" fight it is best to ask your follower to wait somewhere else out of sight. Canine followers can be possessed by spriggans. To fix this, kill the spriggan and have the dog be downed by something other than your weapon; when it gets back up, the problem should be resolved. Be aware of your follower being behind you, especially if you have equipped them with magical staves and are in tight areas. They will have no qualms about targeting the enemy right through your character. With the Hearthfire add-on installed it is possible to turn some followers into a steward of one of your properties. Animal followers can be kept as pets at the request of your adopted children. If you wish to easily find your follower, have them pick up any quest item that is needed for a quest you do not want to complete. Leaving the quest active will always point to your follower, as they are holding the quest item. If your follower is a member of the Circle, then the minor objective Talk to the Companions leaders for work will always point to your follower (along with the other members of The Circle) as well. Followers will not follow you into the Dark Brotherhood Sanctuary and various other quest areas. They will wait outside. In some cases, followers will not follow you into an area during a portion of a quest, but will come with you into that area when that part of the quest is over. If you accidently damage a follower enough to turn them hostile, casting a Pacify spell on them and rehiring will cause the follower to remain friendly to you even after the spell expires. However, initiating dialogue with your follower will immediately make them hostile again. Entries need to be tested and properly formatted, and non-fix subheadings need to be integrated or removed. Followers who have the archery skill and come with a starter set bow and arrows will use a single better arrow indefinitely, without using it up. Their misses and kills still show up on the ground and in the loot window and can be picked up. The single arrow may eventually disappear after an unspecified number of shots. In some instances, their standard bow may be required, but generally the follower can use any bow the player chooses to give. The unlimited arrow "bug" occurs with any single arrow given to the follower. Followers may always use their default hunting bow in favor of better ones given to them. Archer followers will only use a bow and arrow combination where the base bow damage (before upgrading with smithing or enchanting) plus arrow damage falls within the range of 15-22. Otherwise they revert to their starter bow and/or iron arrows when in battle. If you place items in a container and then command the follower to "take all items" the items they take from the container may now carry the "Stolen" tag. If you command followers to pick items up off the ground, they can carry an infinite amount of weight and their movement speed does not appear to be affected but there are several issues associated with doing this. Drop items to be picked up in stacks of 5 or less. If they are dropped in stacks of 6 or more they will only pick up one of the item, and the rest will be lost. They can pick up multiple stacks of 5 or less. 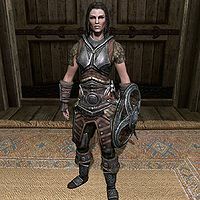 You may not be able to take back a piece of armor you have ordered your follower to pick up if it is identical to the follower's starting armor or the armor they are currently wearing. Trying to remove it from their inventory will give the message, "You cannot take your follower's starting items." Killing your follower will allow you to get the items back, but they will be marked as stolen. Putting them on a mannequin in your home will result in the same bug as with the follower, leaving you unable to get your armor back. Often, when you retrieve the items picked up by your follower through the inventory exchange dialogue, those items will be marked with a "Stolen" tag, even when they are not stolen. This can be avoided if you first pick up all items, then drop them on the ground one by one (or stacks of 5 or less) before asking the follower to pick them up. Finally, after getting the items back again, you should drop them on the ground and pick them up one last time. The console can be used on PCs. Enter "setownership" on any container and all items placed in the container (before or after the command) can safely be picked up by the follower. However, as it also removes the stolen flag on actual stolen items, it should be used with care so as not to spoil the gaming experience. When encumbered past their limit by using the exploit, there have been instances where the follower is incapable of drawing their weapon in battle. They will still attempt to attack the enemy but will be incapable of doing anything except take a beating. This issue can sometimes be resolved by entering a new area that requires loading. A follower may not leave the recovery state even when their health is fully replenished but instead continue crawling around on the floor. This can be fixed by entering combat again with a new enemy, attacking them, fast-traveling to a new area, reloading a save, or healing them with a Restoration spell. ? Sometimes after a fight, the follower will be partially disabled, i.e., will not regenerate health, will not move or follow, will not sheath weapon when you do, will not have conversation menu, but will verbally respond to being healed. Using the console kill command seems to fix his or her state without actually killing him or her. The Unrelenting Force Shout will sometimes break them out from being stuck. Fast traveling nearby or casting Paralyze on them sometimes works as well. Followers may lose carry weight after being dismissed and then rehired. This is due to them receiving extra copies of hidden equipment upon rehiring, which can be removed with the console. You can move distant objects by holding the Use button while giving orders to a follower. ? You can have more than one follower at a time with the Dawnguard add-on. If you have the Dark Brotherhood Initiate as a follower when you recruit Serana you may keep both followers. You may then be able to to have a Housecarl follow you as a third follower unless you have Cicero and Serana. If you drop an item and move it around in the game world and then ask your follower to pick it up, they will go to the place it was initially dropped and pick it up there. Your followers might sometimes enter buildings via a different door than you. Followers may become stuck on terrain when returning to their original locations after being dismissed. ? Use the console command prid (RefID) to target a lost follower and then use the command moveto player to place them at your current location. Your additional followers may not wait when commanded, and often get in the way. If you also have a dog with you, they may get stuck in doors. With the Dawnguard add-on, crossbows may randomly disappear from a follower's inventory when loading a game. ? If the game's files are corrupted, this may cause certain (or in most serious cases, all) followers to be interacted with but without any follower dialogue, leaving the followers to only communicate with generic greetings given by NPCs. ? A quick workaround this issue is to use console command, select the follower in question and type addfac/addtofaction 0005C84D 1. This will not entirely restore the follower's dialogue and script but it will allow players to recruit followers if needed. A sortable table of all followers' maximum stats. Esta página foi modificada pela última vez à(s) 17h46min de 20 de março de 2016.